Christopher asks: "Is netflix changing to a half-star rating system soon?" Blockbuster has been using the half-star system since they launched, and I think it enables me to rate movies with more accuracy. There are very few "5 star" movies, but I have a bunch that I would rate 4.5 stars (and a few that deserve .5 stars). What do you think? Would it make a difference in how you rate movies? David Lepore caught somone stealing his Netflix movies. "This woman was sly, the dogs didn’t even hear her and they were in the living room next to the windows. We jumped in the car and caught up with her a block down the road and confronted her in the parking lot of an apartment building. We told her to return the movies to us and she pulled them out of the front of her pants (ewwww) and said “Sorry”. The New York Sun writes about how video stores are reacting to Netflix, Video Stores React to Netflix by Focusing on Human Touch. With the runaway success of Netflix, local video stores have been forced to decrease their prices, offer first-rate customer service, and in general stress one asset the DVD rental Web site lacks — the human touch. The measure would generate about $500 million by placing a $50 tax on every property in the state. The funds would go to specific K-12 education purposes, including class-size reduction, textbooks and school safety, plus facilities money for schools that have not received state bond funds. The Mercury News has some backgroung information about Reed Hastings recent sale of Netflix stock at $23.66, Netflix CEO sells under Rule 10b5-1. Just the week before, Netflix Chief Executive Reed Hastings exercised options to buy 2,500 shares for $1.50 each, which he then sold for $23.66 a piece, along with 7,500 shares owned by his family's trust. Hastings has bought and sold the same number of shares every week since late October under a trading plan filed last July with the Securities and Exchange Commission under Rule 10b5-1. 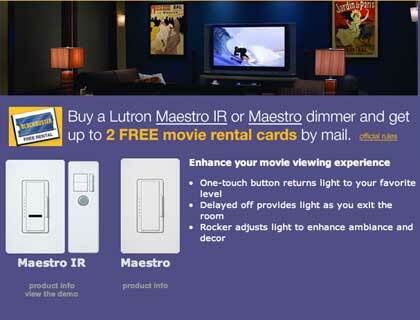 A promotion from Blockbuster & Lutron Electronics: Dimmer and a Movie. Click here for the full list of new releases for this week (70). Interesting movies include V for Vendetta, The Shaggy Dog, Curb Your Enthusiasm: Season 5, Studio 60 on the Sunset Strip - NBC Pilot (Netflix exclusive, includes Kidnapped pilot), Kidnapped - NBC Pilot (Netflix exclusive, includes Studio 60 premier), Mrs. Harris, The Comeback: The Complete Series, God's Sandbox, Alice in Wonderland (with Sammy Davis Jr.), and Burning Man: Beyond Black Rock. I've been told that the new Friends features have been rolled out to all subscribers by now. I've always had a problem with the voyeuristic side of Netflix Friends. It seems a bit strange to be able to peek into someone's account and see what they have at home or in their queue, but I've also discovered a lot of great movies I would have never seen. I like the AJAX-based movie slider -- very slick. It's also nice to be able to browse movies by the cover. As noted in the comments on the orignal story, I also have a problem with the lack of a button to send the note to all of my friends. I was told that this update was designed for members with a small number of friends, and they will be making additional changes to better serve people with a large group of friends.